Let's talk about snacking...we all do it & we should! Eating every 2 1/2 - 3 hours will keep your metabolism burning throughout the day. Look at the total calories you need for the day & make a plan as to how you will divvy up those calories between meals & snacks. You will most likely end up with 1 or two snacks a day that should be around 100 calories. Now you could easily grab for one of those "100 calorie packs" of cookies, crackers, chips etc. that are so popular right now. But stop & look at all those gross ingredients...salt, sugar, oils, & a bunch of junk that I'm not sure how to pronounce. It will stave off your hunger for about 1/2 hour & then you'll be scrounging for something else to eat. Instead reach for some fresh, natural foods (whose ingredients are minimal & you can pronounce all of them) & feel good about what you are FUELING your body with. Combine a complex carb (fruit or veggie) with a protein to keep you full longer & to keep your metabolism burning! Reach for some plain Greek yogurt & fresh berries, celery & natural peanut butter, raw almonds & an apple, fresh veggies & 2 Tbls. hummus, or even Shakeology. All of these are around 100-150 calories & will be much more satisfying than those chips & will be good for your body! 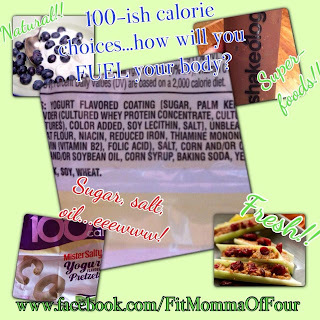 What healthy snack will you swap out your 100 calorie pack for today?? ?